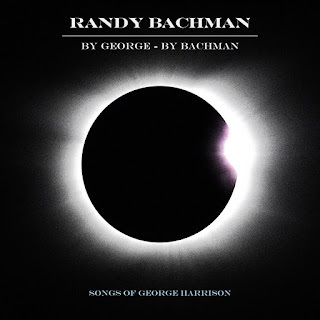 02 February 2018 (Toronto, ON) – Multiple Hall of Famer, songwriter, singer, and guitarist Randy Bachman announces the release of By George – By Bachman, a respectful and personal testimonial to George Harrison’s finest work. Available March 2 via Universal Music Canada, the country’s leading music company, the album is heralded by the release of “Here Comes The Sun”, available today as the first instant grat track along with the launch of the album’s pre-order. Lead radio single “While My Guitar Gently Weeps” is the album’s second instant grat track and will follow February 16. Bachman began work on the project in March of 2017, enlisting his band of nearly a decade: Marc LaFrance as co-producer/drummer, Mick Dalla-Vee on bass and keys, and Brent Knudsen for additional guitars. Bachman and his band developed a process for creating demos for such time-tested material, reflecting the spirit of the source within their fresh approaches. Over weeks of back-and-forth, the songs took shape and indeed some of the demo recordings made it to the finished record. “While My Guitar Gently Weeps”, the album’s lead radio single, was one of the tracks that came together very quickly. Bachman and his band took a tougher flavoured edge to the track, adding hard-driving drums, thumping bass, raging guitars, and lots of vocals, and later sent the song to well-known blues guitarist, Walter Trout, who added in some screaming guitar solos. The band lived with those first recordings for some months before returning to the studio in September to finish the album, this time at Calgary’s Studio Bell – a facility within the National Music Centre, where Bachman’s ‘59 Les Paul guitar (on which Bachman wrote and recorded “American Woman” with the Guess Who) is on display as part of Canada’s Music Hall of Fame. The studio houses all variety of rare and vintage gear, from the Rolling Stones’ mobile recording studio to a historic Trident (Triad) A Range Console. Using these tools connected Bachman to his previous recording lives as well…as part of channeling elements of the past to weave through the present. Bachman stands in rarified air as a member of a very exclusive handful of artists who have topped the charts in two different bands: “American Woman” with The Guess Who and “You Ain’t Seen Nothing Yet” as leader and singer with Bachman-Turner Overdrive. In a career spanning over five decades, he has earned 120 platinum, gold and silver records. His distinctive brand of guitar-driven, no-holds-barred hard rock is instantly recognized worldwide. As host of the top-rated CBC and Sirius XM radio series Randy Bachman’s Vinyl Tap, his listeners number in the millions. As the most celebrated musician in Canadian history, Bachman counts among his many accolades his membership in the Order of Canada and the Order of Manitoba, as well as being twice inducted into the Canadian Music Hall of Fame and Canada’s Walk of Fame, and his inductions into the Canadian Music Industry Hall of Fame, the Musicians Hall of Fame in Nashville, the Canadian Songwriters Hall of Fame, and the Prairie Music Hall of Fame. He is a recipient of the Manitoba Order of The Buffalo Hunt, the Governor General’s Performing Arts Award, the ASCAP Global Impact Award, and holder of an honorary Doctorate in Music from Brandon University. Bachman has also earned multiple JUNO Awards as a songwriter, musician, band member and producer. In addition, Bachman can add best-selling author to his numerous list of accomplishments, having penned both Vinyl Tap Stories and Tales From Beyond The Tap. Bachman will kick off celebrations of By George – By Bachman with a concert at the B.B. King Blues Club in New York City on February 24, a day from what would have been George Harrison’s 75th birthday. The band then turns to Canada for a month of concerts, with more dates to be announced for spring and summer. For the complete list of confirmed 2018 tour dates, visit: RandyBachman.com.